The government along with its policy makers and tech savvy people of the young India are still in the 'Dark Age' when it comes to adoption of internet and e-services. With a country of over billion people, more than 15 percent of our GDP is coming from the service industry (IT/ITeS). The large multinational corporations set shops in India in late 20th century after the government assured massive freebies in the name of tax sops and IT parks developments. Those multinational corporations’ including Amazon, Google, Intel, Texas Instruments, IBM, Microsoft are able to host their cloud from the same country where its ‘aam-admi’ is devoid of a basic internet connection with a minimum assured speed of 512kbps. When certain Western and Southeastern countries in the world are reaching great heights through internet revolution, here in India we still dream for a 2 Mbps connection with least 70 percent uptime. The cartelisation of internet bandwidth market has led to high bandwidth rates, thanks to the efforts taken by TATA, Airtel and RCom for denying the power of Internet. Even the union telecom ministry is not able to face the situation on the ‘alleged’ cartelisation. The fate of Bharat Sanchar Nigam Limited is still hanging in the air. The company once proud of their cross-country presence is in shambles due to day today interference of DoT. After the 2G spectrum allocation scam, the administration of BSNL went on a roller coaster ride. “BSNL is one of the white elephant maintained by the Union government,” said a BSNL staff on condition of anonymity. The massive workforce of more than one lakh is no more use, hurting the efficiency of the company. The core network and equipments are IP based network, however, the company still depends on the skill of its line man who has no up-to-date knowledge on the modern equipment. I hope, massive reduction in ailing workforce and increase of administrative freedom to a certain limit will turn the white elephant an African elephant in a decade's time. The announcement of Bharat Broadband Network Limited with much fanfare by the union telecom ministry is another project built on the dreams based on PSUs like BSNL, Power Grid and RailTel. The OFC network of BSNL spanning every nook and corner of the country is an advantage for BBNL. However, the bureaucratic red tapeand restrictions surrounding the tenders for purchase of OFC’s, GPON equipment and ONTs are posing great risk on the efficient roll-out of the network. The three private telecom companies that command over 90 percent of the internet gateways were not included in the project. The government simply ignored these companies onto the board of BBNL. After selling stake of VSNL, the government lost its control over the international bandwidth market. Without international bandwidth, developing a countrywide optic fiber network is rather a huge risk taken by the government. Even though the government promises to roll out more e-governance initiative, commercial roll out of broadband service across the nation alone will bring in the much needed internet penetration in terms of numbers. Connecting every village level offices will not benefit the masses. In my honest opinion, the government must set tough regulation to control the gateway operators with strict tariffs. 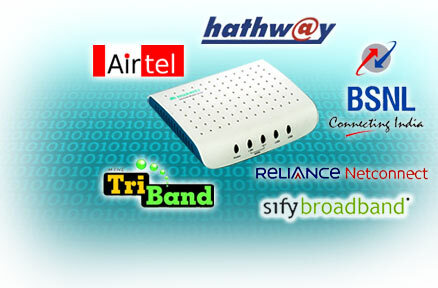 Lastly, the last mile connectivity is a major roadblock faced by the telecom companies. To solve the issue, the government must come forward to open up the unlit fiber capacity of PSU ISPs. Only then, the internet penetration will be a success story like mobile phone revolution for a country of Billions. As Cauvery is drying up due to the adamancy of Karnataka to release water, huge loads of rice from the State have started flooding the delta markets. Owing to the lack of paddy procurement from delta districts due to the failure of kuruvai and the apprehensions over samba, rice mill owners in the area have started procuring paddy from Karnataka to keep their mills going and pay wages to workers. For Ramachandran, a departmental store owner on the outskirts of Tiruchy, the sale of Karnataka ‘Ponni’ has soared in the recent past. Shopkeepers in the city echo Ramanchandran’s views about the increased sale of Karnataka variety. Karnataka farmers went ahead with the summer crop while Kuruvai ‘died’ due to lack of water. Now, the traders in Karnataka were giving their harvest at a lower price than TNCSC procured variety, he added. “The Bangalore wholesale market has amicably priced their variety lower than TNCSC aiming to woo rice mill owners from Tamil Nadu,” says Selvam a rice mill owner near Musiri. 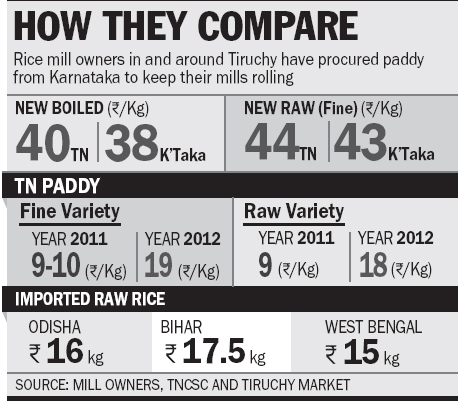 Last year, rice mills across the state were able to avoid paddy from other states as the TNCSC had ample procurements. Unfortunately, this year rice mills in the state face financial crunch due to the failure of Kuruvai. Paddy from Karnataka offered a better deal than importing rice from far away states like West Bengal, Odisha and Bihar, he added citing the transportation cost involved in the process. “Around 440 mills in the state are either shutdown or operating with meagre paddy supply. The pricing of paddy in Tamil Nadu has taken a U-turn this year. Raw variety rice from Tamil Nadu is doing a brisk business due to the export market dependent on Kerala,” said Selvam adding, “However, the fine variety paddy has lost its market to Karnataka and other paddy growing states”. Besides private rice mills from delta districts, owners from Ramnad, Kumari, Nellai and Sivaganga were in a distress situation. The mill owners have appealed to the state government to find an alternative to resolve the deadlock in the local rice market. Works for the National Law School, one of the Chief Minister J Jayalalithaa’s major initiative for the district, is progressing rapidly and it is expected to open its doors by the academic year 2013-14. 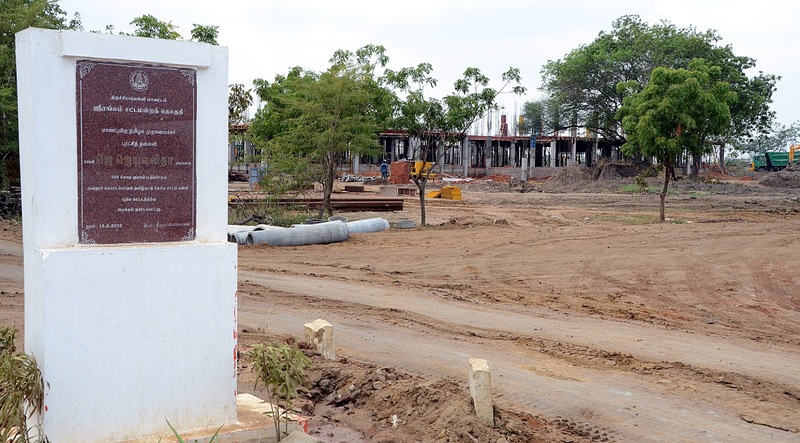 Speaking to Express, PWD officials who are engaged in the construction and supervising of the project said, the law school is coming up on a 25-acre plot at Navalur Kuttapattu in the outskirts of the City and would house 20 buildings with all the basic amenities. Presently, around eight buildings are under construction at the site with the State government funding Rs 100 crore. With a total built-up area of around five lakh suare feet, separate blocks were under construction for under-graduates, post-graduates, besides an examination hall, administration building and a huge library. Separate hostels for men and women with a total capacity of 300 students are also under construction. The PWD officials supervising the project assured that the buildings under construction would be completed before the 2013-14 academic year. The law school will possibly begin its admission and students would be attending the classes in the new buildings, said a revenue department official. Situated near the Tiruchy-Dindigul National Highway, the school is expected to become a prominent landmark for law students across the State. A pet project of the Chief Minister, it is being set up in the lines of the National Law School, Bangalore, which is one among the 17 autonomous law schools in India, the officials said. Contents in this blog are works of the author and subject to copyrights issues. Powered by Blogger. Blog by Shreenesh Raman is licensed under a Creative Commons Attribution-NonCommercial-NoDerivs 3.0 Unported License. Based on a work at illusionist-future.blogspot.com. Permissions beyond the scope of this license may be available at the website. Copyright © 2012 My space on the web.